AGL CEO Mr. Prashant Joshi participated in the panel session on topic High Technology in Hydropower which was held within the framework of the 3rd Central Asian Regional Economic Cooperation (CAREC) Energy Investment Forum on September 11 in Batumi, Georgia. Mr. Joshi highlighted the objective of the high technology applications in power sector which is to deliver clean, reliable and affordable power to consumers and also talked about the challenges hydropower projects face these days. “Development of power projects is becoming increasingly complex due to increasing awareness and sensitivities associated with environmental and social impacts as well as fast changing market requirements. Technological advancements need to be leveraged at every stage of the projects from conceptualization, design, construction and operations” – stated Mr. Joshi. He also noted that the scope of high technology applications should not focus only on lowering capital and operating costs, but also to respond to environmental and social compliance requirements, dynamic market needs, and safety of plant personnel and equipment. The delegations of the Central Asian Regional Economic Cooperation member states (which include Georgia, Azerbaijan, China, Pakistan, Afghanistan, Kazakhstan, Kyrgyzstan, Turkmenistan, Uzbekistan, Tajikistan and Mongolia), government officials and also the representatives of international financial institutions such as the World Bank, the European Bank for Reconstruction Development and the USAID participated in the Forum. 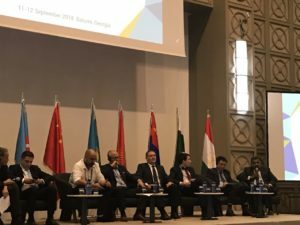 The Forum lasted for two days with the objective to introduce CAREC countries to new energy technologies and relevant policy reforms and support encouragement of investments in energy infrastructure.